Customers often buy multiple EpiPen devices to have at school or work, and the devices expire, which means they must be replaced every year, even if they're unused. Lisa Deck buys EpiPens for her two sons, ages 2 and 4, who have severe food allergies. The devices, known as epinephrine auto-injectors, can mean the difference between life and death for 1 in 50 Americans who suffer from anaphylactic reactions. Auto-injectors deliver a one-time dose of epinephrine, also known as adrenaline. The drug opens up a person's airways, reduces swelling and stabilizes blood pressure. “It's not a choice; I need them,” Deck said about paying $440 for each carton of the devices this year under her high-deductible healthcare plan. The average price for one injector in 1986 was just under $36. Experts say regulatory challenges and the liability drugmakers could face if just one device fails are hurdles to creating a competitive market. That means patients and parents of children who could suffer from anaphylactic shock and account for the highest percentage of prescriptions face high costs and frustrating realities. Deck, who likes her high-deductible plan because it helps her control medical costs, has a sister who gets EpiPens with no copayment. Mylan's name-brand EpiPen—which comes in a two-injector pack because patients sometimes need a second dose—costs consumers about $535 when purchased under two major insurance plans, before a $100 coupon, according to sample data from Oration, a software company that helps companies and their employees reduce prescription costs. Out of pocket, the device can cost as much as $574 with the discount. Customers often buy multiple devices to have at school or work, and the devices expire, which means they must be replaced every year, even if they're unused. Some studies have suggested that the yearlong shelf life approved by the manufacturer and the Food and Drug Administration may be conservative. Because epinephrine auto-injectors can mean the difference between life and death, drugmakers shy away from entering the market, limiting the options for patients and insurers. For most drugs or devices, patients might shop around. But Dr. Bobby Lanier, a Fort Worth, Texas-based allergist, said most of his patients end up using EpiPen rather than competitors such as Adrenaclick, which is made by Horsham, Pa.-based Amedra Pharmaceuticals. 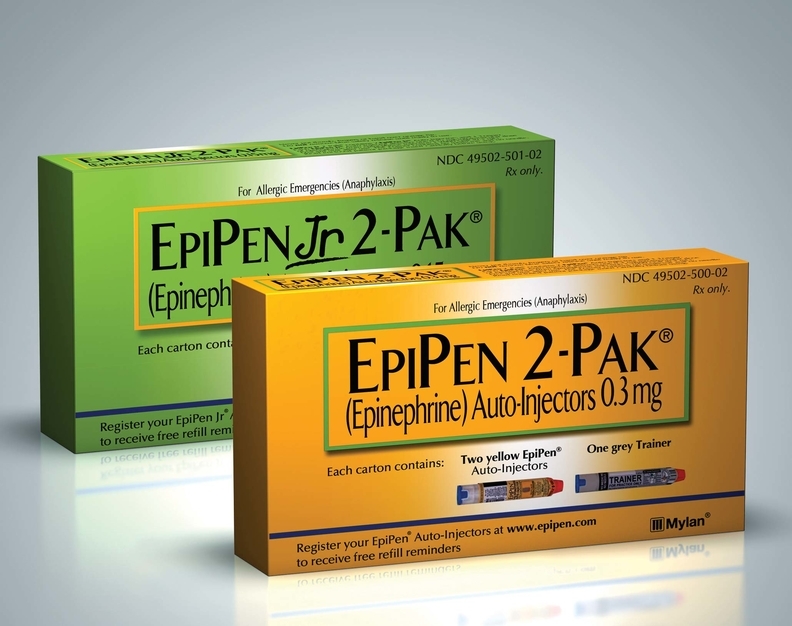 Multiple estimates put EpiPen's share of the epinephrine auto-injector market at about 85%. Amsterdam-based Mylan declined to comment for this story, as did a number of pharmacy benefit management companies and insurers. Consumers and experts who spoke to Modern Healthcare about epinephrine auto-injectors didn't have significant experience with Adrenaclick and noted that it isn't always covered by insurers. That includes Cheryl Fruiterman, a food allergy support group leader in Albany, N.Y., who purchases EpiPens for her husband and her 12-year-old son. Fruiterman said she pays nothing under her husband's “Cadillac” health plan. Even with lower deductibles, some insurers place limits on the number of auto-injectors covered each year, so consumers who have multiple anaphylactic episodes may end up spending higher out-of-pocket amounts. Competition could drop the price of EpiPens, but a device can never fail, Lanier said. Therefore they go through exhaustive, continuous testing that constitutes a significant capital investment for a drugmaker. A would-be rival, Auvi-Q, was recalled by French drugmaker Sanofi because the device reportedly delivered an inadequate dose. Israel-based Teva Pharmaceutical expects to market a generic version of EpiPen this year. Moody's Investors Service said in November that Mylan's “eventual loss of exclusivity” in the EpiPen market won't hurt the company too much given other products in its pipeline. Fruiterman welcomes competition, not because of the cost, but because of the innovation it brings. Her son and husband liked Auvi-Q, which fit in their pocket unlike the long, circular EpiPen. Her insurer, however, didn't cover Auvi-Q. For Deck, it boils down to cost. If her doctor prescribed a lower-cost equivalent to the EpiPen that was safe and appropriate, “I would, of course, choose the lowest-price option,” she said.